The purpose of this memorandum is to define the Coastal High Hazard Areas in those areas on the Gulf Coast with mapped Advisory Base Flood Elevations (ABFEs) and clarify requirements for FEMA-funded projects in Coastal High Hazard Areas. The Unified Federal Environmental and Historic Preservation Review (UFR) Library contains documents associated with UFR Process development and implementation. These documents, the Tools and Mechanisms, are for federal, tribal, state, and local stakeholders, including applicants and EHP practitioners. The Tools and Mechanisms unify and expedite environmental and historic preservation (EHP) review for proposed disaster recovery projects because they can be in place before a disaster occurs, are scalable to the needs of a particular disaster, empower applicants, enable EHP practitioners to share data, apply existing efficiencies within EHP requirements to disaster recovery projects, and introduce new compliance pathways for specific EHP requirements. The library contains the following: UFR Frequently Asked Questions, UFR Newsletters, Practitioner and Leadership Briefing Packages, Applicant Guide, Practitioner Guidance, Data Standards List and Instructions, Disaster-Specific Memorandum of Understanding (MOU), Interagency Meeting Checklist, EHP Agency Point of Contact Lists and Instructions, EHP Disaster Recovery Skills Checklist, UFR Process Glossary, IT Resources List and Instructions, UFR MOU, Prototype Programmatic Agreement for Section 106 of the National Historic Preservation Act, Template Environmental Checklist for FEMA and HUD, and UFR Fact Sheets for various stakeholders. The purpose of this policy is to issue Advisory Base Flood Elevations in the implementation of FEMA Assistance. In light of the devastating hurricane events in the Gulf Coast region, FEMA has gathered and is assessing available flood hazard data for the areas impacted by Hurricane Katrina and Rita. Based on the preliminary assessment, FEMA has determined that the 1% annual chance flood event depicted on the effective or preliminary Flood Insurance Rate Maps in some locations does not adequately reflect post-storm conditions. The purpose of this document is to share the framework FEMA is considering to implement E.O. 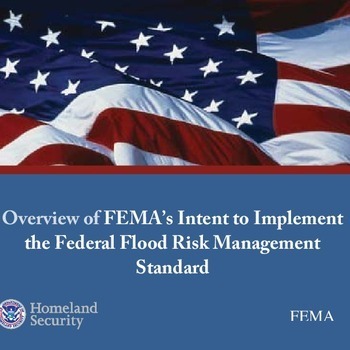 13690 and the Federal Flood Risk Management Standard. FEMA is proposing to develop a new policy which will establish how FEMA will implement the E.O. 13690 amendments and the FFRMS. Greensheet provides guidance and assistance to communities after a disaster by providing information on regulations, policies, processes that may impact recovery specifically as it relates to Environmental and Historic Preservation. Greensheet provides guidance on policies, regulations, and considerations for environmental and historic preservation issues after a disaster to aid in a community's recovery. Greensheet provided guidance on policies, regulations, and considerations for environmental and historic preservation issues after a disaster to aid in a community's recovery. An outline for how to prepare an Environmental Assessment (EA) for FEMA-funded grant projects, including specifications for the public comment period. Greensheet provides guidance on policies, regulations, and considerations for environmental and historice perservation issues after a disaster to aid in a community's recovery. This "Greensheet" provides you with guidance on the agency’s environmental and historic preservation review process. If you are seeking funding for disaster recovery from FEMA, please read this carefully. As is the case with all-federal funding, certain requirements related to the environment and historic preservation must be fulfilled. This brochure provide information to help you better understand the factors that must be considered as you begin to apply for FEMA funding. The information and assistance described here will help avoid any undue environmental and historic preservation roadblocks or funding delays. The Greensheet provides guidance on the agency’s environmental and historic preservation review process. Environmental Compliance Greensheet for Acoma Pueblo - This "Greensheet" provides you with guidance on FEMA’s Environmental and Historic Preservation (EHP) review process to help you understand your obligations to ensure that all Federal compliance requirements are met and how compliance may impact project funding. FEMA EHP staff is available to answer questions and direct you to other resources as needed.